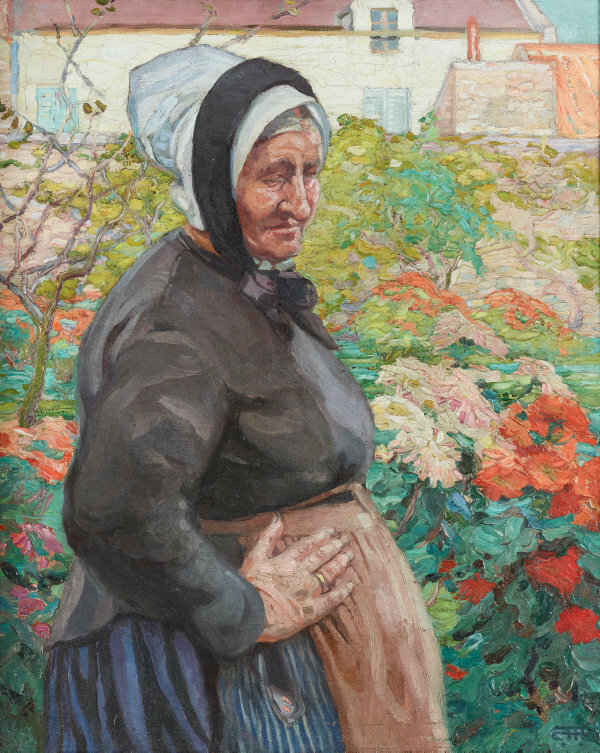 'Grand mère' was painted by Hilda Rix Nicholas in Étaples, Northern France. 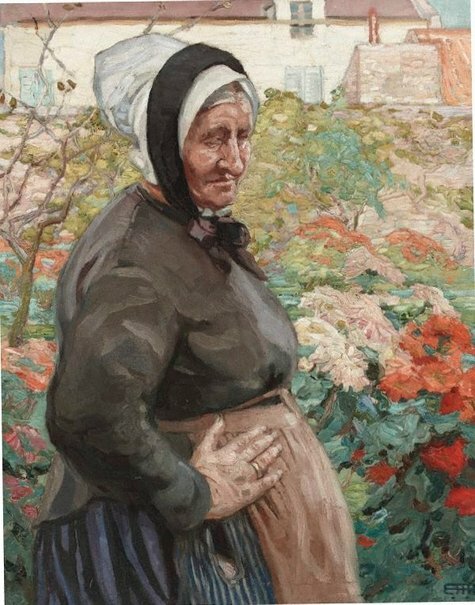 Executed in the open air, the artwork depicts an elderly peasant woman in a blossoming garden. Rix Nicholas sets the subject of the painting firmly in the frontal plane of a luminously colourful background, an influence of post-impressionist Paris. Short brushstrokes of thickly applied paint animate the pictorial surface and showcase the artist's draughtsmanship. Rix Nicholas's works were acquired by the French government, exhibited in the Salon and the Société des Peintres Orientalistes Français, and she was elected an Associate of the Société Nationale des Beaux-Arts. Signed l.r. corner, blue oil "EHRix [monogram]". Not dated. Ann Galbally, The Edwardians: secrets and desires , 'Reflected selves', pg. 106-121, Canberra, 2004, 118. Peintres Australiens à Etaples , 'Hilda Rix Nicholas', pg. 62-70, Étaples-sur-Mer, 2000, 69 (colour illus.). Joanna Mendelssohn, Bulletin , 'Public grief, private happiness', pg. 102, Sydney, 21 Oct 1990, 102. Note: general reference. John Pigot, Brought to Light: Australian Art 1850–1965 from the Queensland Art Gallery collection , 'A national heroine. Hilda Rix Nicholas: the fair musterer', pg. 138-141, Brisbane, 1998, 140. Catherine Speck, Hilda Rix Nicholas: the man for the job , 'The brilliant early years', pg. 65-73, Bendigo, 2010, 66 (colour illus. ), 67. Bertram Stevens., The Art of Hilda Rix Nicholas , 'The Art of Hilda Rix Nicholas', Sydney, 1919. Note: general reference. Features reproduction of 'In Picardy.' from NGV and 'A Mother of France.' Both paintings have similiar subject matter; not paginated. Elena Taylor, Une Australienne: Hillda Rix Nicholas in Paris, Tangier & Sydney , 'An Australian in Paris', pg. 9-22, Mosman, 2014, 16, 17 (colour illus. ), 43, 74.